The seasons have changed and we’re headed towards the summer – so it’s the perfect time to get a new haircut and enter the new season feeling simply fantastic. What’s going to be the hot hair do of the season we hear you ask? Well, this season, it’s pretty special indeed – let’s talk lavender. Pastel hues are all the rage both in fashion and in hair, and the ever-popular ombre style is taking a pastel twist this season – and we love it! Pastel colours are so flattering for all types of hair colour – especially lavender. 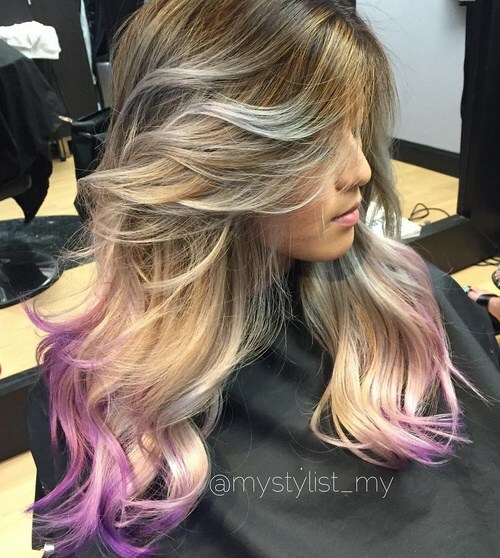 Here’s some gorgeous ombre lavender hairstyles to get you excited. 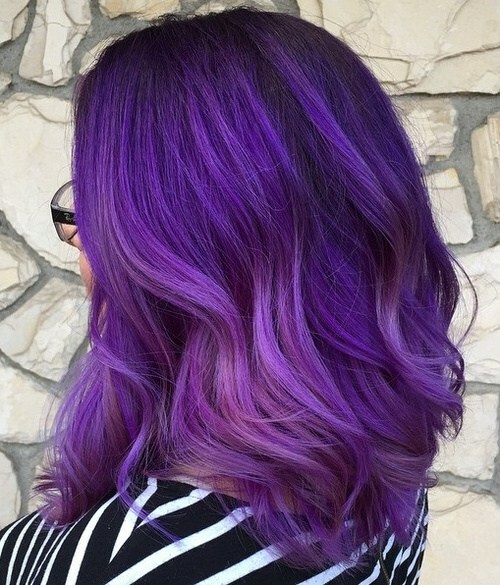 This gorgeous lady has gone for an injection of ombre lavender in the most subtle way – simply finishing the tips of her hair with this beautiful purple tone. 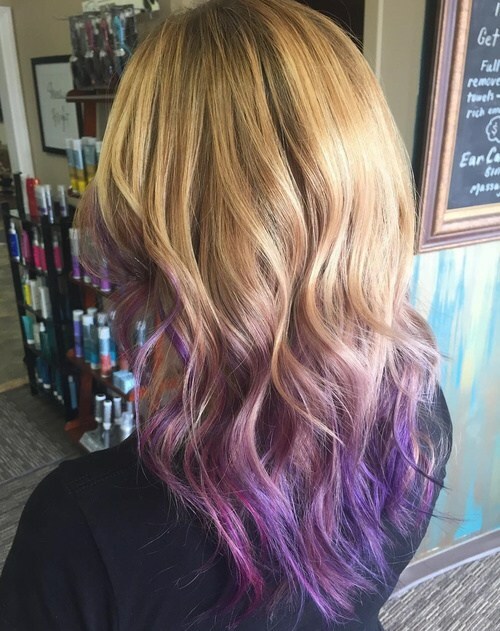 The roots are dark, the hair is blonde and the tips are lavender, yet somehow this combination of colours looks cool, sleek and simply incredible! We love the loose barrel curls to really show off the colours. 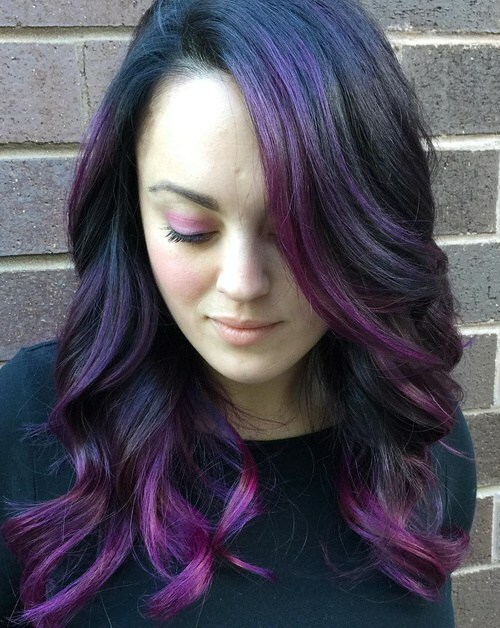 If you want a new hairstyle that will absolutely transform your appearance, then why not take inspiration from this fabulous lady and go for bold lavender streaks from the root? The colour starts subtly in chunky flashes along the parting and finishes in a fabulous flush of colour around the ends. It looks amazing on this straight and sleek style. 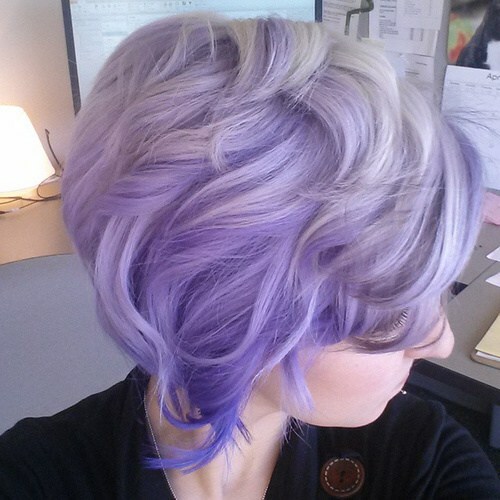 This lady’s beautiful pastel lavender curls are so on trend – and we think she looks amazing! This beautiful, soft colour works perfectly with light brown hair, blending effortlessly into the ombre and looking absolutely magical with this bouncy curled style. 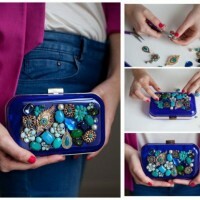 This is the perfect style to go for if you want to subtly experiment with some colour. If you love this color idea, you may love these beautiful balayage hairstyles. This lady has gone for gorgeous lavender streaks to frame the face and accentuate her beautiful features, whilst adding a pop of vibrant colour to her glossy locks at the same time! We think this colour looks absolutely fabulous against her dark hair colour, and the subtle streaks around the face fall perfectly in soft curls around her shoulders. 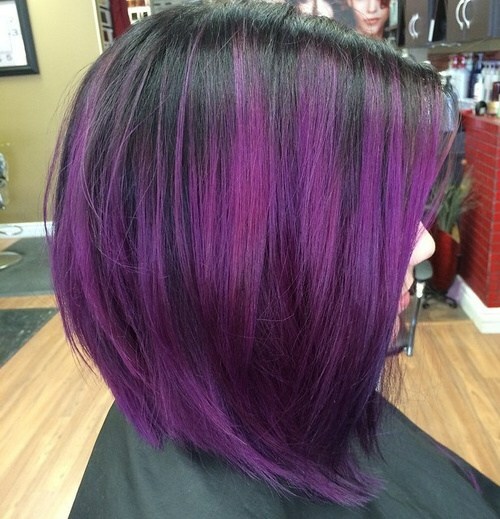 If you have very dark or black hair, then we think this gorgeous red-toned lavender ombre looks simply phenomenal. In subtle streaks all over the hair, this stunning and rich colour blends perfectly with this lady’s dark natural hair colour to create a striking overall ombre effect that we think looks spectacular. 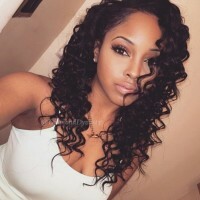 Ideal for curly or straight hair! This lady loved the lavender look so much she’s gone for an almost all over colour – and when it looks this good, who could blame her? 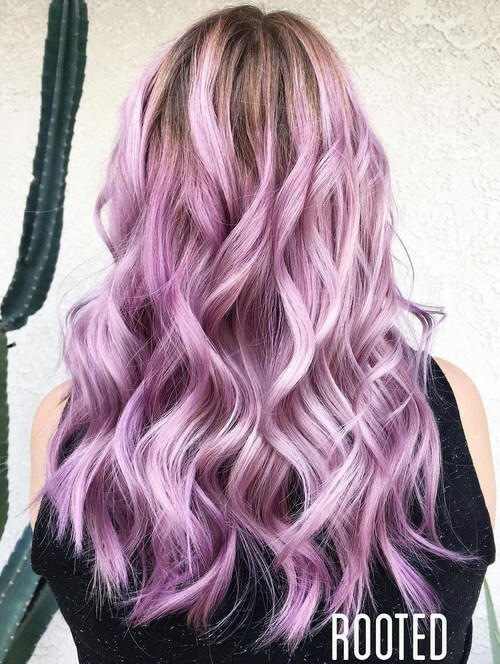 In a stunning pastel lavender which blends subtly from the root, this gorgeous style falls in long, tousled waves down to the centre of this lady’s back. 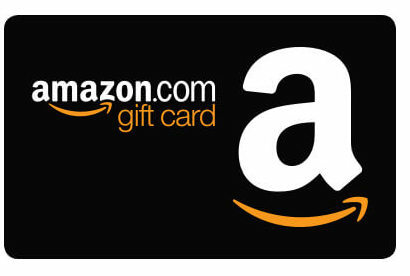 We think this would look incredible up or down, don’t you? 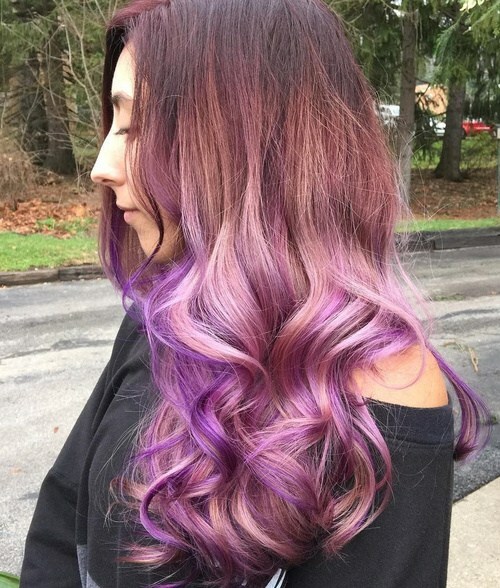 Why settle for one shade on the purple spectrum when you can incorporate so many gorgeous tones into your haircut like this amazing lady? Instead of choosing one lavender hue to highlight her hair with, she’s got a rainbow of different purples running through her hair which looks simply breathtaking when curled – as you can see in the picture. This beautiful ombre cut might be one of our favourites of the bunch – and you’re only at the top of this fabulous blog post! 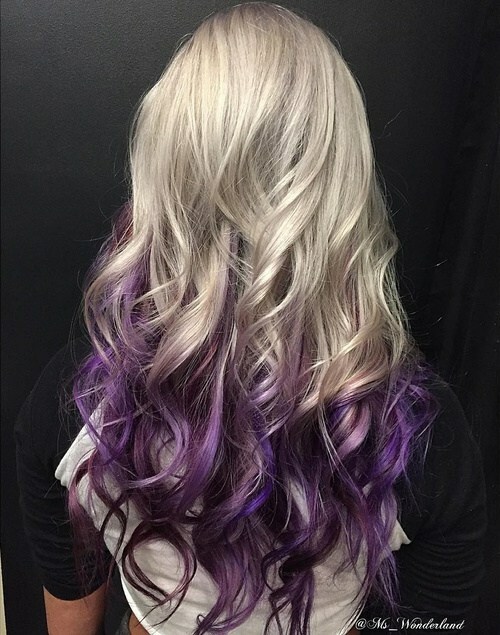 This beautiful and vibrant lavender seamlessly blends with the dark roots and is finished just perfectly with big, bold curls that fall perfectly down past this ever so stylish lady’s shoulders. 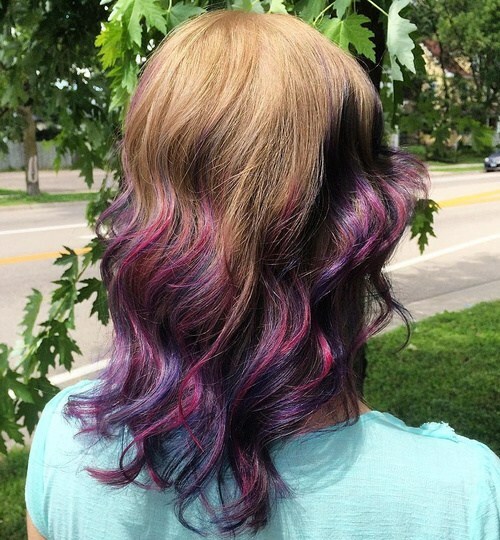 We love this vibrant look! This cut is slightly edgier than the previous girly hairstyle, but equally as gorgeous! 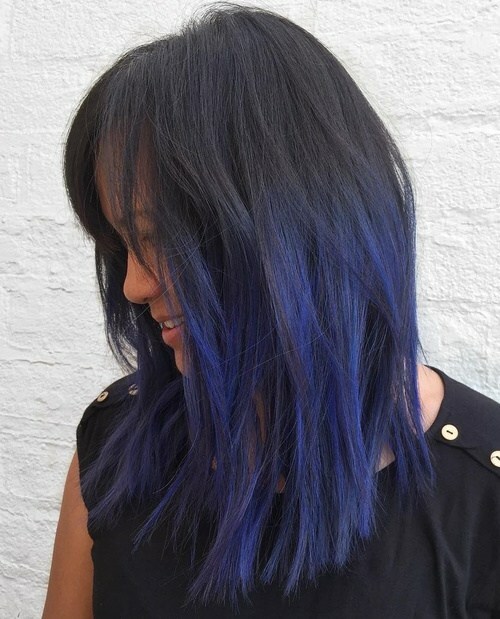 This fabulous blue-toned lavender ombre style looks just perfect on this straight and choppy cut. 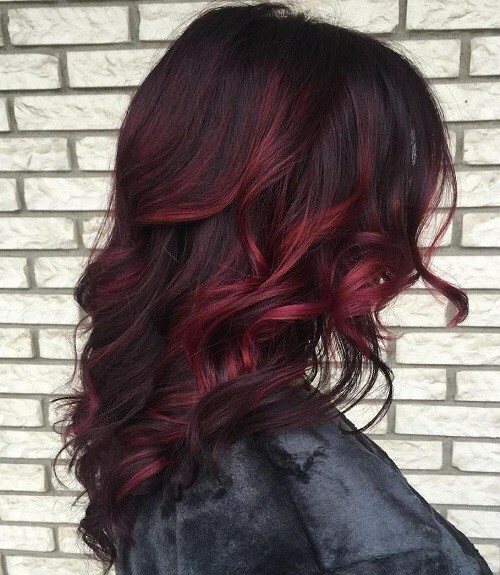 The colour fade starts just above the ears and the blend is stunning – meaning this colour combination would look amazing on either straight or curly hair. What’s the point in adding a gorgeous colour to your hair without showing it off suitably? This incredible and extravagant braided up do is the perfect way to show off your new luscious pastel locks – and your hairdressing skills at the very same time! 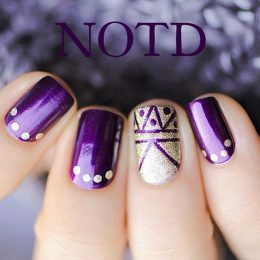 This look is just perfect for an event or a posh party to wow the crowds. Why opt for one pastel colour when you can have two? 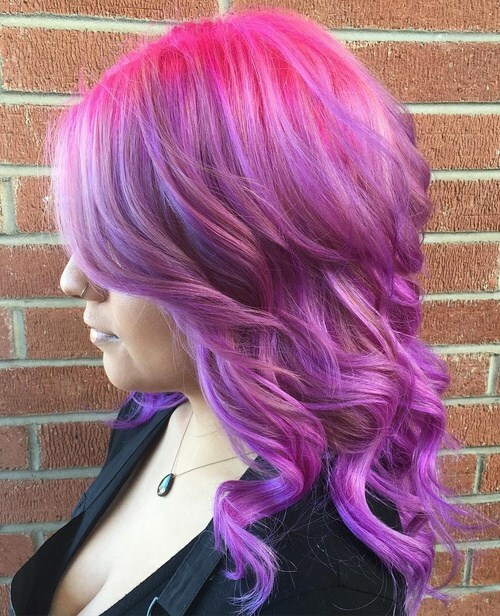 This stunning hair cut starts with a bubblegum pink root all around the parting and softly falls into a beautiful lavender tone for the body of the hair and all around the ends. Light and bouncy curls accentuate this gorgeous ombre job but we think this colour combination would look awesome on any style. 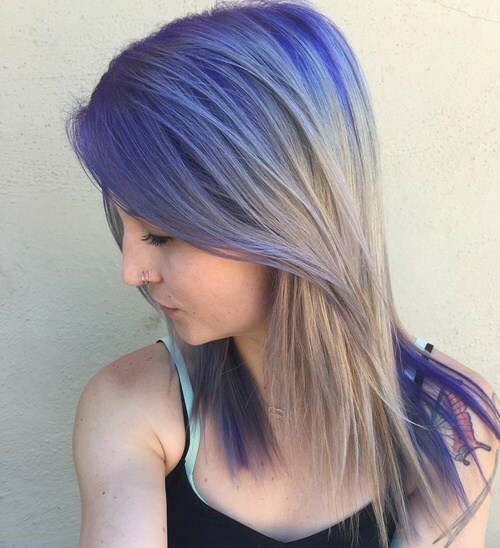 This incredible lady has adopted the lavender ombre trend but flipped it on its head – by going for a vibrant blue toned lavender at the root instead of at the ends! This stunning hairdo goes from a gorgeous lavender root into an icy ash blonde around the ends, offering a unique take on the trend that is taking the hairdressing world by storm. 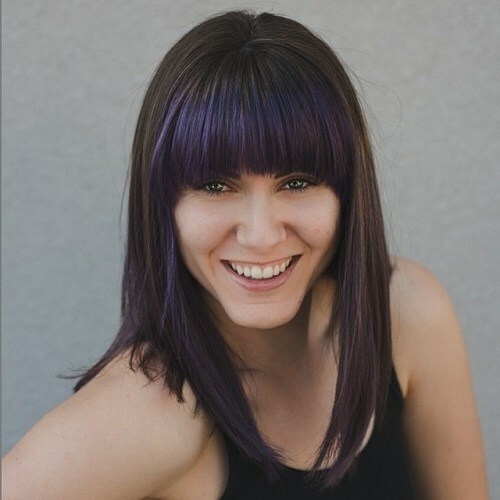 This gorgeous long cut goes from a striking silver finish to a beautiful and warm lavender tone in one sleek ombre swoop. Combining two hair trends in one, this lady has managed to embrace the lavender ombre trend and get on board with another amazing fashion statement – silver hair! We just adore this colour combination and those curls. This stunning sweeping hair do uses lavender in beautiful ombre streaks across the parting, meaning all the ends fall in a beautiful pastel colour. Working against a dark root, this colour really comes to life and we think it looks simply stunning – especially on a smooth, sleek and sweeping style like this fabulous lady has in the picture. This clever lady has accentuated her incredible ombre lavender look with a pinned half-up, half-down style that showcases her fabulous flash of colour in a stunning and sophisticated way. Finished off with beautiful curls, this look would be simply stunning to attend a wedding or an event – somewhere you wanted to really show your amazing locks off! 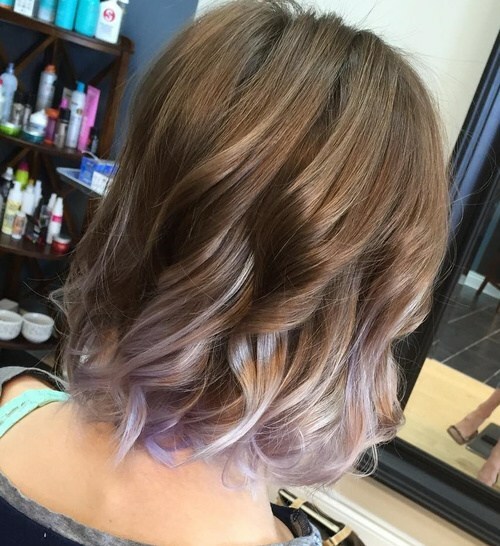 Lavender ombre doesn’t have to work on just long hair – and this lady with a stunning cropped cut is a fine example of that! She’s opted for a light lavender across the root to bring life into her lovely short layers, going with an ombre look into a gorgeous deeper lavender tone at the ends of the hair. We love this cropped cut with a slight curl. This beautiful blonde ‘do is finished perfectly with subtle ombre ends which add a gentle pop of colour to this lovely and fresh cut. The warm honey-toned blonde is perfectly complimented by the pastel ends and it looks simply gorgeous with softly curled ends like this woman’s gone for in the picture. 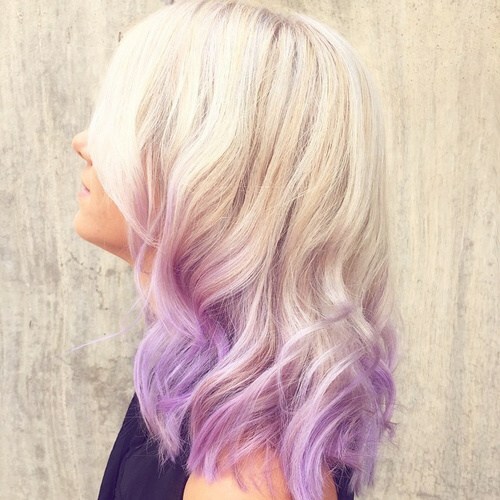 We think this lavender look would look amazing on smooth and straight hair too. This stunning white blonde to lavender shoulder length cut is so gorgeous! This look is definitely one of our favourites of the bunch – the ombre style blends so effortlessly from ice blonde to purple and it’s accentuated to perfection with the beautiful curls pictured here. This lady looks particularly stunning with shorter layers to frame the face. 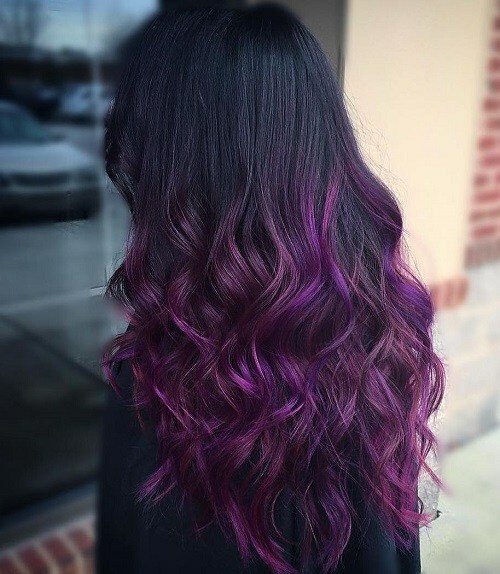 This stunning luscious long lavender locks look is absolutely beautiful – leaving us with huge hair envy here! 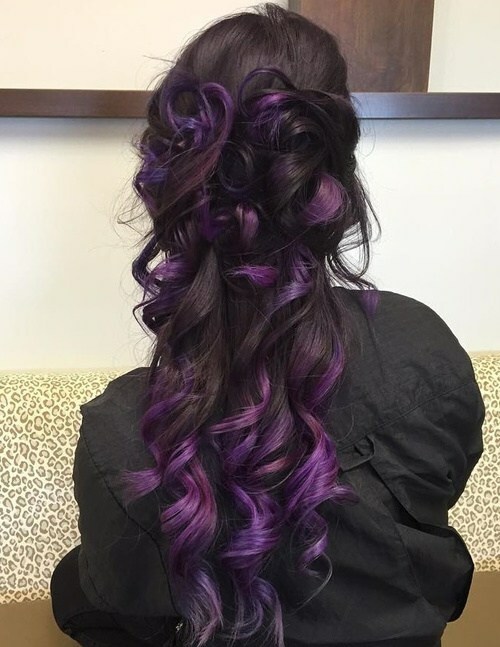 We love the different tones of purple running through this gorgeous haircut, especially as it all falls in giant barrel curls from the neck down. These pastel tones work perfectly alongside the brown roots just perfectly and this would look gorgeous as an up do too. This fabulous picture shows that lavender works on any hair colour! 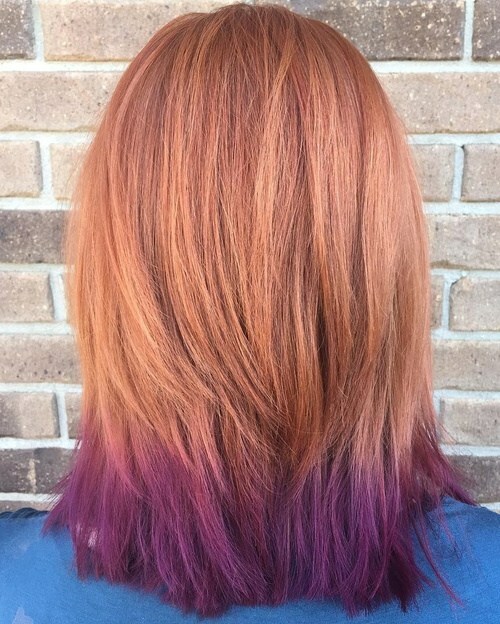 We’ve previously seen stunning examples of blonde, brown and black to lavender ombre styles, but this copper to ombre is just as beautiful, we’re sure you’ll agree. This fabulous crop is finished with purple ends and looks gorgeous straight – but add in some girls for a fabulous night out look! 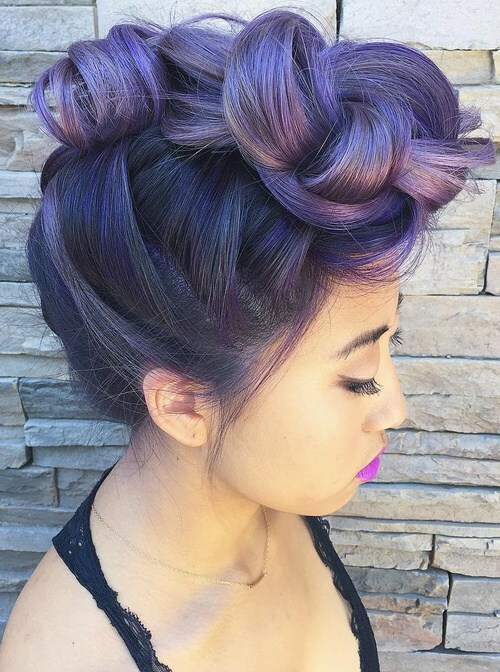 Check out Hair Color Ideas: 20 Gorgeous Pastel Purple Hairstyles. This is a stunning example of lavender ombre – but with a twist – this lavender ombre is from one shade of purple to the next, and we think it looks simply sublime. With a gorgeous dark lavender colour at the root and finished with a beautiful lighter pastel, it proves that an ombre style always looks incredible – even from one tone of a specific colour to the next! We’ve brought you a stunning selection of lavender ombre hair styles – and there’s so much more where that came from! 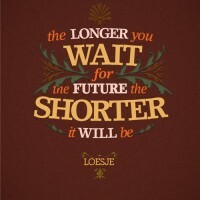 Our blog is full of fantastic hair inspiration, so make sure that you explore our other posts at stylesweekly.com too.